Pure Welsh butter. Suitable for vegetarians.Our fruit scones are bursting with orange soaked fruit, real butter and buttermilk. 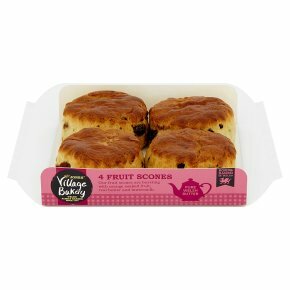 The deliciously light fruit scones are made with plump sultanas, raisins and currants soaked in orange juice to give a rich and fruity taste. Made with real butter and buttermilk. My favourite: eaten with a dollop of strawberry jam and clotted cream with a cup of tea.